Let me introduce y’all to Sarah Kain, a twin mom friend who is both a supermom and children’s fashion entrepreneur. 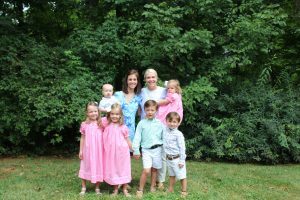 At the moment, all she has going is raising three beautiful kids – 5-year old twin girls and a 1-year-old boy – spearheading the spring/summer consignment sale for the Charlotte Mothers of Multiples club (which is next weekend) and running a children’s clothing business she and a friend recently started. That’s where you come in! 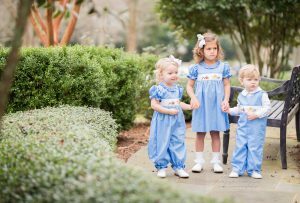 I wanted to share the lowdown on Dogwood Smocking Company where you can order beautiful hand-smocked and embroidered clothing for boys and girls up to age 6. Kain and her business partner, Brittany Luther, design the collections, which are manufactured and sold on a preorder basis. That gives buyers the flexibility to plan ahead for holidays, church occasions, school and family photos and just finding lovely children’s pieces. They have just released two new spring looks – the Noah’s Ark Collection and the Dogwood collection – both of which will be available for preorder for the next several weeks. Check out their website and find @dogwoodsmockingco on Instagram. Meanwhile, read on to find out what Sarah Kain and the Dogwood Smocking Company are all about. Q. Where did you get your love for smocking? A. My mother is an amazing seamstress and made some beautiful smocked pieces for my two brothers and me growing up. She was born and raised in Charlotte, but I grew up in Pittsburgh, and I think I might have been the only child in town who wore smocked dresses! 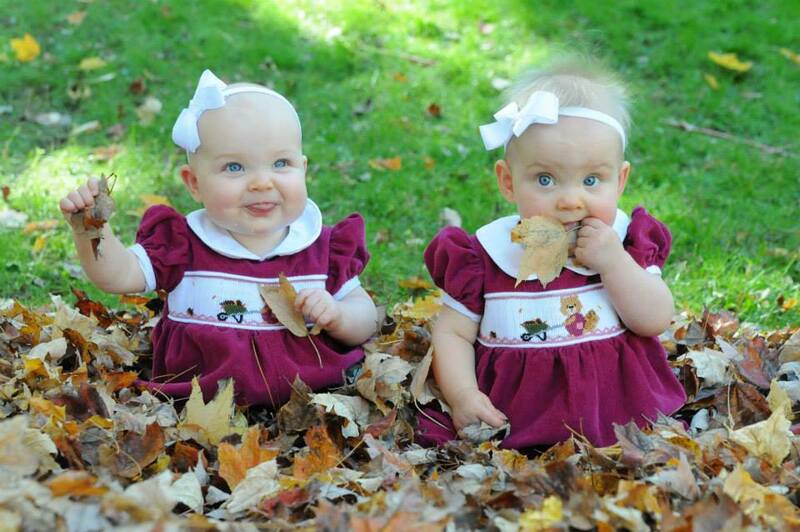 I have absolutely loved putting (those same clothes) on my little ones as they grow up. Having my own children to dress has really made me appreciate the art and the time that goes into it. My mom taught me to smock, although I’m not nearly as good at it as she is. Q. For those who aren’t familiar, can you explain what smocking is? A. It is a style of sewing where you pleat the fabric (there’s a special piece of equipment that basically squeezes it into a tiny accordion with hundreds of rows) then sew a design onto those pleats. The actual smocking holds the pleats together. Smocking can include some specialty embroidery stitches, but regular embroidery or appliqué work are different because they aren’t done on pleats. The fact that it’s done by hand and is time-consuming is what tends to make it more expensive than typical kids’ clothing pieces. Some companies do make machine-smocked clothing, which can lower the price point a little, in my experience there’s a noticeable difference in the quality and level of detail compared to true hand-smocking. Q. Do you start out making some pieces for your twins? A. I did. I made little corduroy rompers with a squirrel with a wheelbarrow on them for my girls for their first fall when they were a couple months old. It was cool to put that time in and see them in them. I also made their first birthday outfits. In true third-child fashion, I smocked the insert for Andrew’s first birthday outfit and never got the outfit made, so it’s going to turn into his second birthday outfit….My girls are reaching that age where they start to protest (wearing smocked outfits) a little more as church clothes they don’t want to wear. For a while if something was smocked with lady bugs they were happy to wear it whether it was smocked or not. Now they’re getting smart to it. I know my years are limited of putting my own children in it, so this was a good outlet for me to still find and make things that I like. Q. How did you and Brittany meet and get together on this? Two embroidered outfits from their Christmas collection. Q. 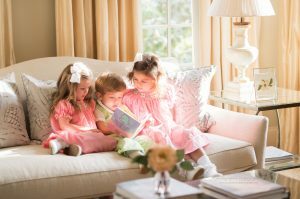 What do you love about classic children’s clothing? A. I love the look of a pretty smocked dress or a little boy in a jon-jon, but I also love that it still looks “little.” I’m a big believer in the whole “let them be little” line of thought. Kids grow up so fast these days anyway and will have plenty of time to wear big kid clothes. For the age when I can put them in pretty smocked dresses and little longalls with cute patterns and colors and collared shirts, I’m absolutely going to do it. I also truly love that these outfits can be heirlooms. You tend to wear them for slightly dressier occasions (although we’ve had plenty of muddy playdates in smocked clothing too! I’m a whiz with OxyClean!) If you take good care of them, you can save your favorites and pass them along. 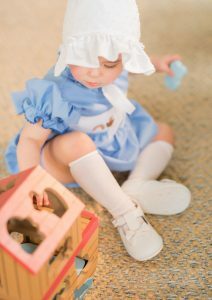 I would love for our Dogwood outfits to be the kind of things people want to put in their child’s “forever box” to pass down. A. Not only is the dogwood bloom the state flower of N.C. there is also a beautiful legend about the relationship between the Dogwood tree and the cross that Jesus died on. 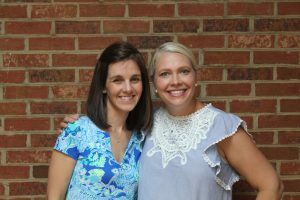 We wanted this company to be grounded in our local Charlotte connections and relationships – we loved that it evoked some local N.C. history – and also connects us back to the church where we met, became friends, and still spend so much time together with our families! Q. What does Dogwood offer consumers they can’t get at local boutiques? A. It’s different variety. We’re another option, and we’re a local option and that was one of the things that we wanted to foster in this – two local moms designing these in a way we think both kids and their parents will like. We offered a sweet knit smocked line for Christmas with Christmas cookies on it and we were really happy with because it was a fun thing that the kids were excited to wear and they looked really cute, so it was a win-win. We also provide the convenience of shopping online. 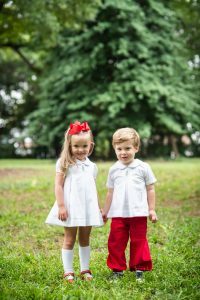 Sometimes it’s hard to find coordinating sibling sets for boys and girls, so we’ve made it a goal to offer several coordinating sibling-set options throughout the year for people who want to match their kids (And we are both totally those people!) As we grow, we also hope to partner with some local and regional boutiques. Hopefully at some point they’ll carry some of our designs. This is ADORABLE!!!! Congrats to Sarah & Brittany!